The emphasis of this lively workshop is getting past the “explanation factor” and zeroing in on the most important factor of all in your work – the you factor! You will learn how to create and rely on a personal rather than a rule-based approach to composition and the formal elements – a key ingredient in turning everyday subjects into creative, imaginative, and expressive paintings. Each day’s lesson will focus on an individual aspect for getting there: seeing and personalizing shapes, structuring abstract compositions, putting together creative color schemes, inventing imaginative ways to work with lines, textures, patterns and more. 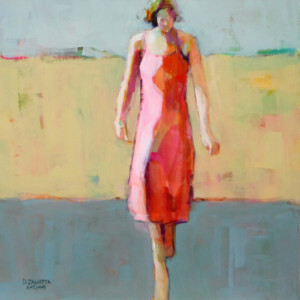 Donna will discuss the importance of choosing a painting medium that works in tandem with your personality and that allows for spontaneity, improvisation, correction, and revision. She will be using watercolor and white gouache in her demonstrations, but students are free to work in any media. Participants should bring reference materials to work on during the week – sketches, still life set-ups, or photos (please only photos you have taken yourself).